Kirby’s power involves inhaling an enemy to gain its abilities. Sucking up a fire enemy may turn the pink puffball into a torch, whereas devouring a boomerang-wielding foe can grant Kirby that weapon for his own use. In his last game, Kirby’s Epic Yarn, he didn’t have these abilities – he instead utilized a skill-set more similar to Yoshi’s, with a leash (tongue) that could grab his enemies and turn them into ball (egg) projectiles. It’s almost as if Kirby sucked up Yoshi before the game began, gaining his powers in the process. In Kirby Mass Attack for the Nintendo DS, he, again, lacks his typical powers. Apparently, this time, he sucked up a whole bunch of Pikmin. No, that’s not the actual story, but it might as well be as far as gameplay is concerned. Kirby has been split into ten micro-Kirbys by an evildoer, and in order to defeat foes and put him back together we need to command them around with the touchscreen. At the beginning of each of the game’s worlds we only have control of one Kirby, but as we gain (and eat) fruit our Kirby army, which sticks with us between the world’s levels, grows. HAL found plenty of ways to take advantage of the gaggle of Kirbys. Nearly every level ends with some sort of boss encounter, be it an enhanced version of an earlier enemy or a new, massive battle. Others are more puzzle-focused, with minor micromanagement necessary to use the Kirbys to overcome obstacles that one Kirby could not. A nonstop barrage of new, interesting foes greet you in every level, with absolutely brilliant gameplay mechanics that are continuously surprising without ever breaking away from the core concept. Micromanagement of these Kirbys isn’t always that important. It’s all about the macro – creating a cluster of puffballs and leading them on a vicious, destructive rampage. They swarm their enemies like Pikmin, beating on them before slamming them into the ground. To engage them in battle you can either flick the Kirbys individually or tap twice on foes, causing your Kirby forces to speed up and leap onto the enemy. You can also draw a line and have the Kirbys follow it, riding a star to hard-to-reach locations. It’s adorable and disturbing all at the same time, and not what we’d typically expect from a Kirby game. But they’re not indestructible, and keeping them alive at all times is, well, damn near impossible. The reason for this is twofold: they’re somewhat delicate (two hits and it’s six feet under), and they don’t always listen. The first part is excusable, and part of the gameplay. The second part, though, is frustrating. While they move together there’s sometimes a straggler or two that fall behind, and we’d sometimes find them stuck on the other side of a wall because of it. Other times, the game’s control inputs, or lack thereof, would lead to confusion. Being mapped entirely to the touchscreen means controls are limited to taps and swipes, with double taps causing them to speed up. Sometimes we’d be trying to toss a Kirby but the game would mistake the motion for a double tap – an action that causes all Kirbys to rush to a location. Useful for running through levels, but it can be detrimental during battles when the Kirbys in mid-attack suddenly turn and rush away because of a mistaken double-tap. It’s only a minor grievance in the grand scheme of things, and it’s sort of our fault, but that doesn’t make it any less frustrating. What does make it less frustrating is the strong gameplay. It’s hard to stay mad, even after a cheap death, when every level is throwing awesome new encounters at you. Everything about the game takes advantage of the collection of Kirbys, and there’s constantly a new clever use of the mechanics that we couldn’t help but smile at. Even the minigames unlocked throughout the game offer versions of other popular genres as if they, too, were invaded by an army of Kirbys. Pachinko, a vertical shoot-em-up, a turn-based RPG – they all get the Kirby treatment, and they’re surprisingly enjoyable, regardless of how insane they might sound. 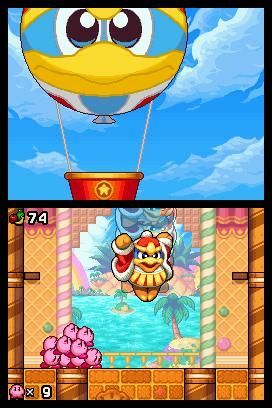 Kirby’s newest and likely final DS outing is one of his best in years. It might not reach the heights of adorability that Epic Yarn did, but it’s definitely a stronger game when it comes to gameplay and longevity. There’s a ton of replayability, numerous unlockables, and more than enough content to justify a purchase. We’re not sure exactly why HAL decided to make a Pikmin-style game with Kirby, but we’re not at all upset at the outcome. Description Kirbys newest and likely final DS outing is one of his best in years. It might not reach the heights of adorability that Epic Yarn did, but its definitely a stronger game when it comes to gameplay and longevity.